Today, succession planning is a very important leadership process and a growing number of firms have formal plans in place. Yet, many firms and sole proprietors have a great deal of succession planning work ahead of them. Among the challenging statistics that have emerged from many surveys on the topic are: Slightly, more than half of firms don’t have a formal, signed and documented succession plan in place. A number of boards know that they have to initiate one and start thinking about how succession planning is going to work only when a key manager leaves. In general, the bigger the firm, the more likely that the firm has some kind of succession plan in place. In the case of a proprietorship, especially a family-owned business, one does not want squabbling among family members. In the case of other enterprises, the shareholders would be anxious to see that the business is sustainable and one key element is that if there is a calamity by one or more top managers quitting that the business is safe. The boss who does not plan for succession is one who is insecure and feels that he would become redundant. 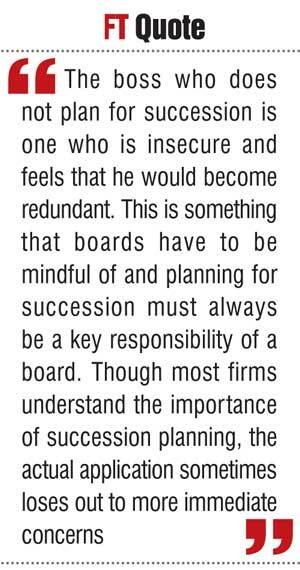 This is something that boards have to be mindful of and planning for succession must always be a key responsibility of a board. Though most firms understand the importance of succession planning, the actual application sometimes loses out to more immediate concerns. That’s understandable in lean economic times: when trying to survive with fewer employees, today’s work matters more than tomorrow’s plan. Succession planning is more or less like preparing to sell your house — it’s not a good idea to notice your roof needs work or there are cracks in your foundation once your home is listed, it pays to have an orderly plan in place, that accounts for all contingencies and includes steps to maintain or increase the market value of your firm. Most firms are missing out on one key aspect of succession planning, which is not having formal written requirements for succession. Many companies have a long way to go for putting in place a succession plan at the top level, which has a bearing on the market valuations of companies, confidence of the business associates and morale of their employees. This is because many successful business leaders and executives are generally caught up in the daily demands of running a company and give very little attention to what will happen to the company once they retire and sometimes fear grooming a successor who could mount a challenge over a period of time. Some of them postpone succession planning because the task seems too demanding, while others assume they can wait until retirement is a few months away. In many companies, succession planning is avoided because of the emotional and sticky/thorny issues surrounding succession. For some, it’s simply too painful to imagine relinquishing control and handing it over to someone else. We have found that while succession planning is important for all types of businesses, it is of special importance for family-run businesses, in which business affairs tend to be closely linked to family members and key shareholders. Many studies have revealed that less than 25-35% of family businesses survive into the second generation and less than 15-17% survive into the third generation – these statistics further suggest the importance of succession planning. Many assume that if they have a five-year strategic plan, they don’t need a succession plan because the new guy who comes in can continue as per the plan. A good succession plan will take into account the business’ future growth trajectory, ownership form and the organisational structure and management. The plan should identify how the transition from one set of leaders/owners to the next will be managed. Furthermore, it provides a means of transferring a company’s accumulated store of trust, respect and goodwill to new company leaders. A succession plan is a formal document, because failing to plan for business succession can mean significant monetary losses and even loss of the business itself. To be effective, a succession plan must also be regularly reviewed by the board and updated to reflect company market changes, industry or market developments. Even in the absence of such changes, an annual review would be of immense value to keep a tab of the talent in the company. A number of crises can befall companies that operate without a succession plan. For example, company leadership can fall into the lap of people who have not been properly prepared for leadership, thus threatening the company’s profitability and endangering relationships with key clients. In addition to preventing a leadership crisis going forward, succession planning offers many immediate benefits. Succession discussions very often help boards to put together a specific future for their company. Boards often emerge from the succession-planning process with a clearer sense of their mission and business goals. They force discussions around company organisation structures, management and operations. The discussion may lead owners to the discovery that some of the skills, existing structures or practices are no longer effective for the organisation and for its sustenance, even forcing a board to review their business model and the people running the company. Most medium to large sized companies have now recognised the growing importance of leadership development planning, i.e., identifying and grooming employees to move into strategic leadership positions within the company. However, for this intervention to be effective, companies need to: (1) identify the kinds of leadership competencies the company needs, (2) identify employees with those competencies and (3) use training and mentoring to ensure their readiness. Preparing key talent for leadership roles is the opposite of crisis management. Rather than waiting until a successful CEO retires or suddenly leaves the firm, thereby creating a talent vacuum, savvy Boards start succession and leadership development planning well in advance. This ensures that someone with the right leadership skills is in the company to take over. However, the steps required to prepare an organisation for succession can take several years – and because succession can be the result of a drop-dead situation as well as planned retirement. However one has to be careful not to allow the crown-prince to feel too comfortable that he is now sure of the throne. He must feel that he is only a strong candidate and no more. Ideally the enterprise should have several options. This could also mean that if a frontrunner drops dead or decides to quit that other options could be pursued. The successor must be a person who has the potential to do things differently with the backing of the existing team or to make changes in the players where necessary. The idea would not be to identify someone who is adequate at his level and make the ‘Peter Principle’ applicable. It is therefore necessary to have a clear view of what could be done better by the business and the current holder of the office himself should be placed under scrutiny. It would be good to look around and see in similar businesses who is a good role model and look for someone who can match his management style and delivery. Therefore, developing a succession plan is not a task to be put off and to do that; the board should get a good look at the company’s rising talent. 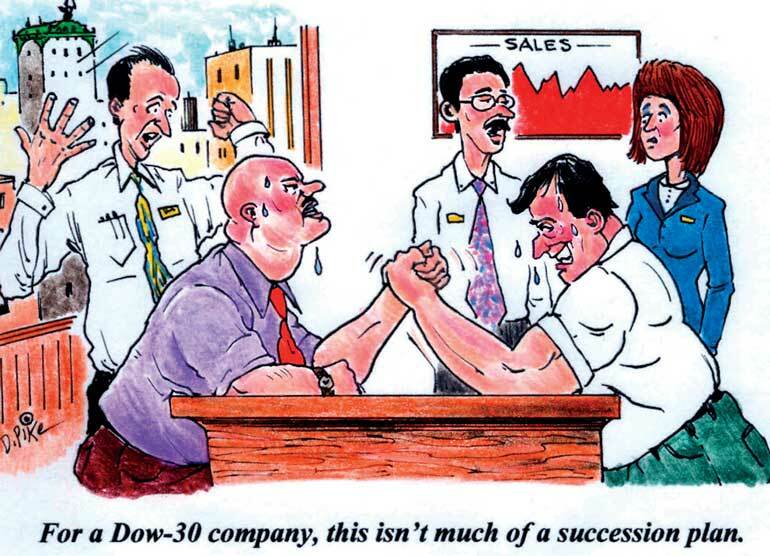 Companies that don’t put into place a strong succession plan will continue to get the CEOs/leaders they deserve and would also be sacrificing long-term stake holder-value. Therefore, there is definitely a business case for following a more-orderly succession processes.